Dunbar Castle is located in Dunbar, East Lothian. 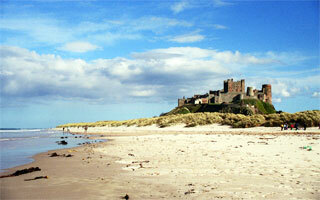 It was the first of the numerous castles once owned and occupied by the Earls of Dunbar. It was first given to Gospatric I, founder of the House of Dunbar, by his cousin King Malcolm III and became the seat of the Earldom of Dunbar. This castle is mentioned in numerous times in early Scottish history due to its fortuitous location. Invading Scotland from the South would require the invaders to either go up the middle of the country or up the side along the coast. Going up the middle required facing all those enraged Scots and would have been suicidal, so the coast was the preferred invasion route. Going up the coast required getting past Dunbar to get anywhere else and was a constant thorn in the English side. Mary Queen of Scots found refuge here twice after Rizzo and her husband Darnley were murdered. Finally after her execution, the castle was torn down for good. All that remains now is show above. If you look carefully at some of the buildings in downtown Dunbar today you will see the stones from the Dunbar castle. Bamburgh Castle is where the maternal grandfather [Uchtred] of Gospatrick family came from in Northumbria...the site is ancient - and very like Dunbar in the way its set upon the North Sea and almost cut off from land. Of course it's been rebuilt and restored many times.